Dyslipidemia is defined as a condition with abnormal levels of any one or all lipids in the blood; it is widely regarded as a major risk factor for coronary artery disease (CAD) and atherosclerotic cardiovascular disease. By 2020, CAD is forecast to be the most common cause of death globally, including India. It is estimated that 17.5 million people die each year in India from cardiovascular diseases, amounting to a staggering 31% of all deaths worldwide. It is thus a serious public health problem. There is no direct reference of dyslipidemia in Ayurveda, but the symptoms of dyslipidemia can be correlated to that of Medoroga (deposition of abnormal adipose tissue), Ati-Sthaulya (over weight), pre-monitory symptoms of Prameha or Santarpanajanya Vyadhi (diseases occurring due to excessive or improper nourishment). In Ayurveda, treatment is of two types mainly Santarpana (nourishing therapy) for Apatarpanajanya Vyadhi (diseases occur due to deconstruction) and Apatarpana for Santarpanajanya Vyadhi (diseases occur due to excessive or improper nourishing) respectively. Rukshana (inducing dryness) is categorized under the Apatarpana Upakrama (depletion therapies) i.e., treatment of Santarpanajanya Vyadhi (diseases occur due to excessive or improper nourishing). Santarpana comprises of Brimhana (nourishing), Snehana (oleation) and Stambhana (astringent or styptic therapy), whereas Apatarpana comprises of Langhana (lightening/reducing), Rukshana (inducing dryness) and Swedana (sudation). Acharya Charaka has kept these six treatment modalities under one roof and named them as Shad Upakrama. In the present era, most of the diseases are of Santarpanajanya mainly caused due to unhealthy food habits, sedentary lifestyle, lack of exercise etc. In the present study, Takra-Siddha Yavagu (gruel prepared from buttermilk) prepared by Shyamaka (Echinochloa frumentacea Linn.) was selected for Rukshana which has been mentioned in Charaka Samhita for Ghritavyapatnashana (treatment of diseases occur due to the improper intake of ghee). Shyamaka is one of the best staples for producing Rukshana. It was postulated at that, owing to the opposite properties of Snigdha property(unctuousness), Takra-Siddha Yavagu prepared from Shyamaka would work in cases of dyslipidemia. It is needed to think that how the ancient Ahara Kalpana (preparation of dietetics) can be popularized and how it can be taken into the practice of current era. Udvartana (dry body-massage) has been described in Dinacharya (daily regimens) by Ayurvedic seers for maintenance of health and treatment of different diseases. In the current era, Sarvanga Udvartana (whole-body massaging in upward direction or opposite to hair root by medicinal powder) can be effectively used in different lifestyle disorders such as obesity, dyslipidemia, especially for reduction of fat from subcutaneous tissues due to its Kapha-Meda Pravilyana (dissolution of abnormal body fat) action. A 42-year-old female patient visited out-patient department of department of basic principles, IPGT & RA, Jamnagar, Gujarat, with the complaints of weight gain, heaviness in the body, and lethargy for 4 months. History of present illness revealed that total 6 kg weight was increased within past 4 months. There was no history of diabetes, hypothyroidism, and hypertension. General examination of the patient showed that her weight was 88 kg, height 152 cm, body mass index (BMI) 38.08 kg/m2, blood pressure 120/80 mm of Hg and pulse rate 76/min. Personal history revealed that she had a habit of Adhyashana (eating too soon after a meal, even though the previous meal was not digested) and Divaswapna (sleeping during daytime) 2 hours daily and sleep during night time was 8–9 hours. Her water intake was 3–3.5 liters daily including intake of one glass of water after meal; frequency of urine was 10–12 times in daytime and 2–3 times in the night time; and regular bowel movement. She is of Pitta-Vata Prakriti with Madhyama Sattva (moderate mental strength) and Madhyama Koshtha (moderate bowel). Her physical and systemic examination did not revealed any abnormal findings. She was diagnosed as dyslipidemic with serum cholesterol 223 mg/dl and serum low-density lipoprotein (L.D.L) 153 mg/dl. Diagnosis has been done on the basis of the lipid profile parameters. According to National Cholesterol Education Program Adult Treatment Panel 3, following range of values have been taken for diagnosis of dyslipidemia. Serum high-density lipoprotein <40 mg/dl. Hence, the patient was selected and treated with Rukshana Upakrama in both ways i.e., internal as well as external. Before administration of treatment, patient's physical measurements such as body circumference of midarm, forearm, chest, abdomen, hip, midthigh, midcalf and skin fold thickness of biceps, triceps, scapular, abdomen, supra-iliac regions were documented to evaluate the efficacy of Rukshana Upakrama by comparing with the measurements after treatment. Dose- The quantity of Shyamaka (Echinochloa frumentacea Linn.) was fixed as 100 g and six times of Takra (buttermilk) i.e., 600 ml was added for cooking. It was given as major meal in lunch, no other regular diet was allowed. Externally –Udvartana yoga (mixture of raw coarse powder of Yava (Hordeum vulgare Linn. ), Bajara (Pennsetum glaucum Linn.) and Kulattha (Dolichos biflorus Linn.) in equal proportion) was used for dry massage. Same diet, lifestyle and sleep pattern was continued by patient except replacement of lunch with Takra Siddha Yavagu. After completion of 30 days of treatment, results were assessed which showed significant reduction in lipid profile parameters (serum cholasterol and triglyceride), body weight and BMI. 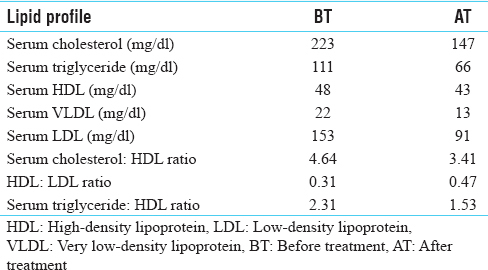 Reduction in the different types of lipid parameters have been showed in [Table 1], reduction in body weight and BMI has been shown in [Table 2]. Decrease in different types of body circumferences and in the thickness of different skin folds have been mentioned in [Table 3] and [Table 4] respectively. After completion of the treatment, patient felt lightness in the body and her appetite was increased. In dyslipidemia, deranged lipid levels are found probably as a result of vitiation of Meda Dhatu. It is originated from the combination of vitiated Agni (diminished digestive system) and vitiated Meda Dhatu (abnormal status of adipose tissue elements). Formation of Ama Dosha (incomplete transformation or metabolism causing harmful effect on health) at different levels is the main pathogenesis for the disease. So for the dissolution of pathogenesis of the disease, the drug should remove Ama Dosha at various levels, corrects Agni and cleanse the Srotas. The ultimate purpose of the management in this disease is to remove the obstruction in channels by creating drynessand cleaningthrough absorption of excessive Snigdhata, to establish normal digestion. The treatment for dyslipidemia is suggestive as Kapha-Medohara protocol. In Charaka Samhita, Takra-Siddha Yavagu has been described in the treatment of complication of chronic constipation Ghritavyapatnashana and Shyamaka is quoted in Rukshaniya Yavagu as best among Rukshana. It has been prescribed in Pathya (specific diet prescribed during therapy) of Santarpanottha Vyadhi because it has property of Rukshana and Shoshana. Shyamaka has antioxidant, and hypoglycemic pharmacological activities. Therefore, it can be understood that Shyamaka has such property to decrease excess Sneha from body which is generated by Kapha. It is having Kashaya and Madhura Rasa with Ushna Virya and Katu Vipaka. Shyamaka possessing a Ruksha property prominent food article; acts as Shoshaka of excessive Meda Dhatu from the body. Shyamaka has mentioned for method of Rukshana it is also mentioned in classics as Kudhanya/Kshudra Dhanya class as well as absolutely beneficial diet, which is also useful for restoration of the normal function of above-mentioned vitiated Agni, Dosha and Dhatu for normalizing function. As dyslipidemia is a result of high calorie diet intake in the form of saturated fats, the selected grain Shyamaka with its less/low nutritional value curtails down the excessive nourishment to Meda Dhatu. Takra is capable to stimulate the Jatharagni and improve Jarana Shakti (digestive power) by which Sara-Kitta Vibhajana (separation of needful best part and execrable part) is possible. Takra has been mentioned for Sneha-Vyapatnashana by Acharya Sushruta. This is the reason why it has been mentioned as dictary medicinal formulation. Udvartana effectively mobilizes the stored fat. It mutilates and liquefies the fat so that it is available for disposal from the system. With the rectification of Dhatvagni (metabolism at the tissue level or seven types of Agni that are responsible for transformation of one Dhatu into another), the cells start throwing away the toxins and Ama and cleanse themselves. Thus, the cellular health is regained. Moreover, the presence of excess fat hampers all sorts of metabolism. By clearing the body of its excessive fat and cholesterol, toxins, etc., which are hindering factors for the smooth functioning of the heart, Udvartana restores health. All the Drvaya, i.e., Yava, Bajara and Kulattha are having properties to alleviate Kapha, Meda (the fourth Dhatu among seven Dhatu of the body, whose function is to provide Snehana). Meda is dominant of Jala and Prithvi Mahabhuta and designative of adipose tissue and other lipids in the body. Ama isincomplete transformation or metabolism causing a harmful effect on health. Hence these drugs are selected for Udvartana, as drug have Ushna (hot) potency, Ruksha (dryness), Lekhana (scraping of Dhatu and Mala after initial absortion of moisture) and due to rubbing and scrubbing with pressure the process during Udvartana, the drug and Udvartana both effectively work on dyslipidemia. Rukshana Upakrama in the form of Takra Siddha Yavagu and Udvartana can help in normalizing lipid profile also in reduction of weight; BMI, body circumference and skin fold thikness in case of dyslipidemia. Current Status of Hearth Disease Statistics in India. Available from: http://www.blog.medicounsel.com/2016/09/12/heart-disease-statistics-india-2016. [Last accessed on 2016 Sep 12]. Hemadri A, editor. Asthanga Hridaya of Vagbhata, Sutra Sthana. Ch. 14, Ver. 1-2. Varanasi: Chaukhambha Orientalia; 2014. p. 223. Hemadri A, editor. Asthanga Hridaya of Vagbhata, Sutra Sthana. Ch. 14, Ver. 3-4. Varanasi: Chaukhambha Orientalia; 2014. p. 223. Acharya YT, editor. Charaka Samhita of Charaka, Sutra Sthana. 7th ed., Ch. 2, Ver. 30. Varanasi: Chaukhambha Surbharati Prakashan; 2014. p. 26. Available from: https://foodandhealth.com/cpecourses/ncep.pdf. [Last accessed on 2016 Sep 12]. Acharya YT, editor. Charaka Samhita of Charaka, Sutra Sthana. 7th ed., Ch. 25, Ver. 40. Varanasi: Chaukhambha Surbharati Prakashan; 2014. p. 132. Acharya YT, editor. Charaka Samhita of Charaka, Sutra Sthana. 7th ed., Ch. 21, Ver. 21-25. Varanasi: Chaukhambha Surbharati Prakashan; 2014. p. 117. Ravirala R. Hypoglycemic and hypolipidemic activities of hydro-alcoholic extract of Echinocloa frumentacea link grains in alloxan induced diabetic rats. J Pharmacol Toxicol Stud 2013;volume1(2): p. 38-51. Acharya YT, editor. Charaka Samhita of Charaka, Sutra Sthana. 7th ed., Ch. 27, Ver. 16. Varanasi: Chaukhambha Surbharati Prakashan; 2014. p. 154. Acharya YT, editor. Charaka Samhita of Charaka, Sutra Sthana. 7th ed., Ch. 27, Ver. 26. Varanasi: Chaukhambha Surbharati Prakashan; 2014. p. 614. Acharya YT, editor. Charaka Samhita of Charaka, Sutra Sthana. 7th ed., Ch. 14, Ver. 84-85. Varanasi: Chaukhambha Surbharati Prakashan; 2014. p. 505. Acharya YT, editor. Sushruta Samhita of Sushruta, Sutra Sthana. 7th ed., Ch. 45, Ver. 84. Varanasi: Chaukhambha Surbharati Prakashan; 2014. p. 203.